Highlighting this auction are two historic collections of items. The first is the Howard Bingham Muhammad Ali Collection. In addition to being one of the most noted sports photographers of the past 50 years, and a biographer of Muhammad Ali’s, Bingham was also Ali’s best friend. After attaining one of his first photography positions at the Los Angeles Sentinel newspaper, Bingham met a young Cassius Clay (later to become Muhammad Ali) when he was assigned to cover him for a story in 1962. The two had an instant rapport, which would be the beginning of what would turn into a lifelong friendship. Bingham would travel the world with Ali, photographing him along the way and capturing some of the most iconic images of Ali that the world has ever seen. Bingham’s photographs have been published in newspapers, magazines, periodicals and books including Life, Look, Time, Newsweek, Sports Illustrated, People, Ebony and many others. In 1993, Bingham released his own book about Ali titled Muhammad Ali: A Thirty-Year Journey. Bingham also contributed a large number of his images to the 2004 Taschen book G.O.A.T. — A Tribute to Muhammad Ali. In addition to capturing iconic images of Ali, Bingham has amassed an incredible memorabilia collection of artifacts pertaining to the three-time Heavyweight Champion over the course of their friendship. Some highlights include one of Ali’s passports, signed twice by Ali, used for travel during Ali’s heyday in the mid-1970’s, photographs and boxing gloves signed by both Ali and former South African President Nelson Mandela, documents and artifacts pertaining to Ali’s participation in the 1996 Summer Olympic Torch Relay, including a 1996 Summer Olympics Torch signed by Ali, and numerous drawings that Ali would create for Bingham in his own hand featuring many different subjects. Most notably is Ali’s drawing of one of the fights versus Joe Frazier. A most unique item in the collection is a tablecloth taken from a dinner with actor John Travolta. Ali drew numerous different images on the table cloth after the conclusion of the dinner, and then, once completed, signed the tablecloth, with Travolta adding his signature as well. A portion of the proceeds of the sale of the Howard Bingham Muhammad Ali Collection will be donated to the Muhammad Ali Center in Louisville, Kentucky. 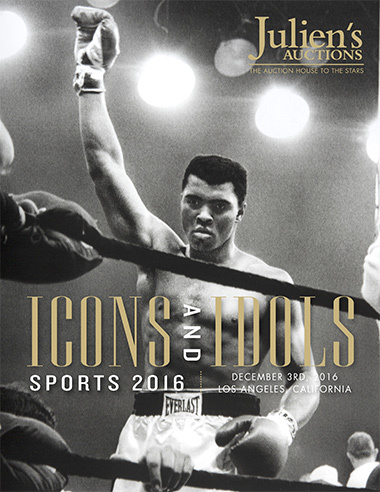 In the Howard Bingham Muhammad Ali collection, there will be numerous other incredible and extraordinary items pertaining to Muhammad Ali’s life and career in the Icons & Idols: Sports 2016 auction. Headlining these items are the gloves that Muhammad Ali wore in his December 7, 1970, fight versus Oscar Bonavena. In only his second fight after a three-and-a-half year layoff, Ali defeated Bonavena by technical knockout in the 15th round of the fight. With Ali rarely ever going the distance in any of his fights, after defeating Bonavena he was quoted as saying “It was the toughest fight I ever had.” Other items of Ali memorabilia featured in the auction include two pairs of boxing trunks worn by Ali while training for his fights, a mouth guard worn for his 1974 “Rumble in the Jungle” fight versus George Foreman, and a pair of gloves worn by Ali, then named Cassius Clay, in bouts when he was an amateur boxer, with the gloves originating from the estate of Sugar Ray Robinson. Ali isn’t the only boxer that will be featured in the auction. Additional highlights include the boxing trunks worn by Evander Holyfield for his first fight against Mike Tyson that was held on November 9, 1996, in which Holyfield defeated a heavily-favored Tyson by technical knockout in the 11th of 12 rounds, and fight worn trunks from Sugar Ray Robinson from his fight with Jackie Cailleau in Nice, France, on October 24, 1964. Robinson would win the fight in a decision after 10 rounds. The second major collection to be offered in the Icons & Idols: Sports 2016 auction will be Pelé: The Collection – Part 2. 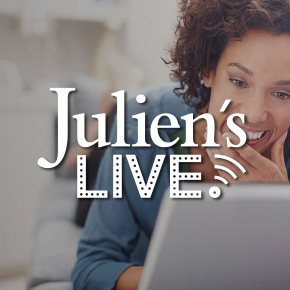 Following Julien’s massive success with its Pelé: The Collection auction that was held in London, England, in June of 2016, Julien’s is honored to present another offering of memorabilia from the personal collection of the world’s greatest and most iconic football player — Pelé. Highlights from Pelé: The Collection – Part 2 include trophies and medals awarded to Pelé in 1958 after leading the Brazil national football team to victory in the 1958 World Cup final, a Santos FC jersey worn by Pelé in a match versus Chelsea FC in 1971, a 1969 Brazil national football team jersey signed by all members of the team that would eventually go on to victory in the 1970 World Cup, and Pelé’s personal passports used for travel around the globe. There will also be a wide selection of trophies, medals and certificates awarded to Pelé over his career, as well as personal effects and artifacts, and many signed items from the greatest footballer in history. Also featured in the auction will be artifacts and match worn items from some of football’s most historic and current stars. Highlights will include two 1950 FIFA World Cup Winner’s Medals from members of the 1950 World Cup Champion Uruguay national football team. Match worn jerseys will be featured in the auction from legendary footballers Eusébio, Diego Maradona, Zico, Michel Platini, Zinedine Zidane and David Beckham, and current stars Cristiano Ronaldo, Lionel Messi and Neymar. Numerous other sports aside from boxing and football will be represented in the auction. Baseball will be highlighted with the offering of Eddie Murray’s 1977 Baltimore Orioles rookie year game worn jersey, along with numerous game worn jerseys from baseball’s current and former stars. A selection of items from Los Angeles Dodgers long-time broadcaster Vin Scully will also be featured. Scully recently retired after serving as the Dodgers broadcaster for 67 years, the longest tenure of any broadcaster with a single team in professional sports history. Julien’s will also be honored to offer unique items from Olympic history — including torches used in Olympic torch relays, starting with a torch used in the 1936 Summer Olympics torch relay, the first of its kind, all the way up to a torch used in the most recent relay for the 2016 Summer Olympic games held this year in Rio de Janeiro, Brazil. Two very unique Olympic items being offered will be a gold medal from the 1924 Olympic Games held in Paris, and a 2014 Sochi Olympics Chelyabinsk meteorite-embedded gold medal.